At the office of Dr. Christian Johnson DMD, we believe that you and your family deserve to have a healthy, radiant smile that you are proud to show off. That’s why we offer professional dental treatment while utilizing only the most advanced technology and dental techniques, particularly for dental implants. If you’re missing a tooth or teeth, it can have negative effects on your bite, the shape of your mouth, the support of your surrounding teeth, and your self-esteem. Our dental office conveniently serves the Waldorf, La Plata, and Brandywine, MD areas to offer implant dentistry and a long-term solution with a 95% success rate in patients. 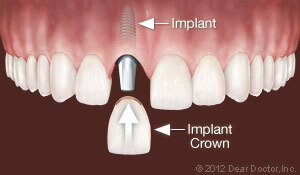 Dental implants are titanium posts that screw into the jaw. 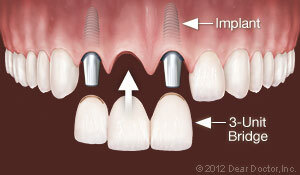 The implant process takes place during a minor surgical operation and will only require local anesthesia. After the post is inserted into the jaw, the patient will need some time to heal, which often takes a few months following the procedure. During that time, the post becomes infused into the jaw. When it is done healing, a crown will be placed atop the post, which will always be custom-made in color, shape, and size for your mouth. The entire process will take place in our Waldorf dentist office. If you are missing a single tooth, the post will simply be placed in the space where your tooth should go. While the cost of the implant might be a little high, the success rate makes up for it, as it will last longer than any other treatment option and be more cost effective overall. A common method for more than one missing tooth is to place two implants on either side of the gap and use it to support bridgework between them. In some cases of severe dental disease, all of the teeth will need to be replaced. 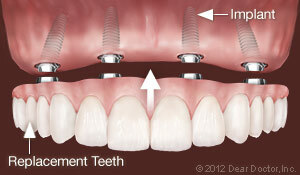 Whether on the upper or lower jaw, a whole arch of teeth can be replaced using a series of implants. Depending on the bone density and health of the jaw, there may only need to be four implants infused for all 10 or 12 teeth. This is a permanent option that acts as a protection for your jawbone and is built to last a lifetime. 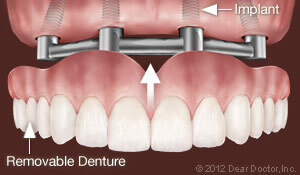 If you have gone the route of removable dentures, implants could still be beneficial. They provide extra support for the dentures and act as a cushion between your appliance and your mouth to lessens the pressure. Taking care of your new teeth is as easy as maintaining your normal oral hygiene routine. You should brush and floss twice a day, visit your La Plata dentist for your regular cleanings, and follow any instructions given by the doctor. If you are prone to clench or grind your teeth, wearing a mouthguard at night will also protect your new implants and help make them last longer. Schedule Your Appointment With Your Local Waldorf Dentist Today! If you’re missing teeth and would like to restore your smile, contact the office of Dr. Christian Johnson DMD in Waldorf, MD today and schedule your appointment. Our doctor and experienced dental staff will work with you to create a personalized treatment plan for you and determine if dental implants are right for you. We’ll get you on the path to your new smile!